What can we do with old electronics which we not gonna use them anymore? Ever think about to create a new stuff with them? It would be like the “Junkyard War” show on TV, interesting! 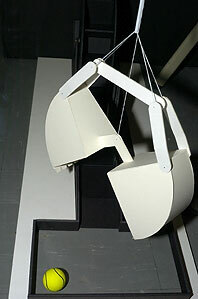 Using the “Likework Clamshell Bucket Mechanism with a Flexible Link” principle made a clam machine/toy. 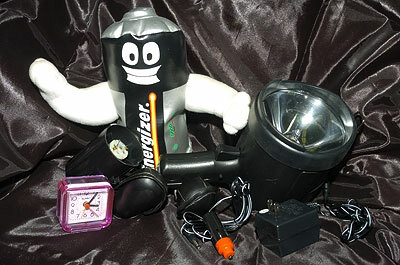 Combination with two-wheel link to create a theatrical toy. The clam works ok, but sometimes the lines twisted then it will get stuck. The two-wheel link system doesn’t work because the ball is not heave enough to press the bigger wheel down. The problem is when those two wheels link to each other then the whole system will get too tight. To solve this problem is changing different materials. 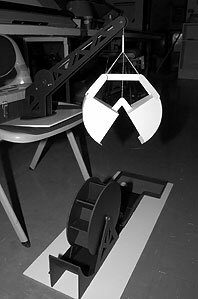 Using wood to make the wheel system instead of foamcord, and using metal ball to get more weight to spin the wheel. Since that, it will costs more time and money. Never take any instruments lesson, and never learn how to do the music composing, just very interesting making music by myself. Apple Computer produced a program called GarageBand which is very easy to create your own music. This is my first music/song work. I played around with GarageBand for couples weeks to finish the music park, then I putted my voice in there. It is not the professional quality, but anyway, just for fun! 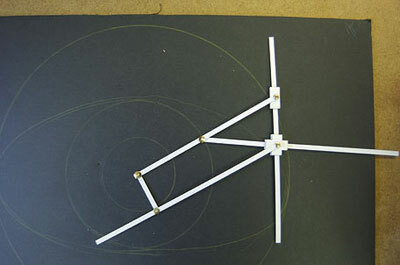 Just done a drawing and model for the Ellipsograph system. With in the model can figure out how this mechanical system work. 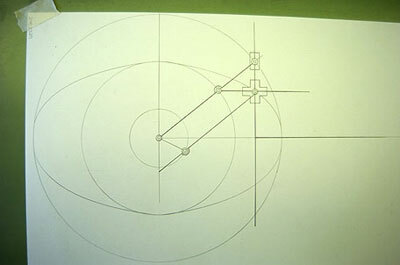 It is just a sketch model but it produced a ellipsograph which looks pretty close to the drawing. 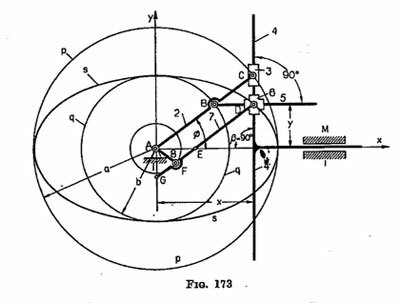 I have received an Email from David A. Stevenson who points out the point F in this ellipsograph figure needs to be midway between G and E, so the model in particular will not looked distorted/twisted. Thanks David A. Stevenson. Trying to figure out the ellipsograph curve. Do the drawings, make a sketch model. This is more like engineering stuff, but it’s quite interesting because I’ve found every gourp is doing the different thing.